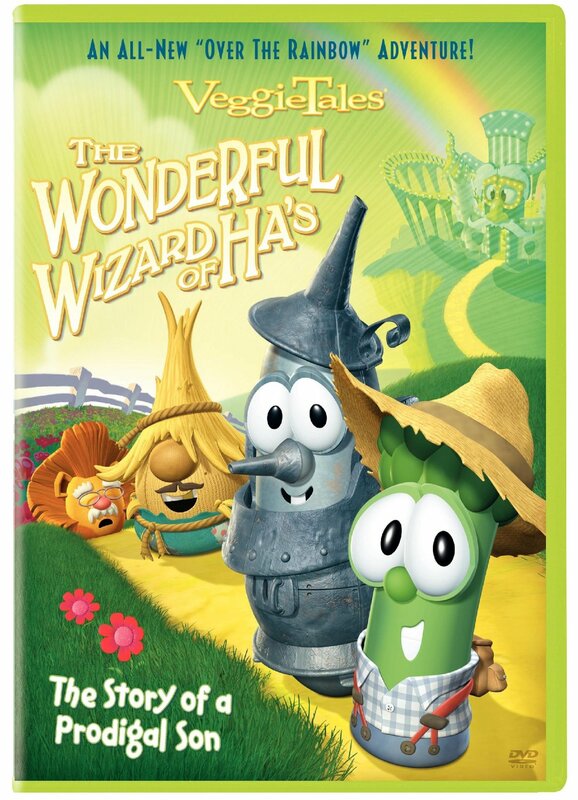 Wonderful Wizard Of Ha DVD features all the meaning and highlights the story of the Prodigal Son rolled up in this VeggieTale fast and funny retelling of the classic tale, The Wizard of Oz. The animated DVD story provides a lesson of forgiveness from Darby, the son of a Kansas dental floss farmer who, more than anything else in the world, just wants to have fun. When he learns about the Wonderful Land Of Ha's - an amusement park with all the fixin's - and it's mysterious Wizard who promises to make his dreams come true, Darby is determined to go. But when his father tells him he's needed to help with the harvest, Darby decides that nothing is going to stop him and he makes a choice that will change his life forever. With his pet dog Tutu by his side, Darby flees the farm and sets off to find the Wonderful Land Of Ha's. Along the way he meets a bored scarecrow, a tin man who wants to ride roller coasters and a lion that craves cotton candy. Each with their own dreams, they set off to see the Wizard. Features the new Silly Song: Monkey. Lunt sings "Over the Rainbow"
Running Time: Approx. 49 min. VeggieTales - The Wonderful Wizard of Ha DVD by Veggie Tales was published by Authentic in July 2011 and is our 9826th best seller. The ISBN for VeggieTales - The Wonderful Wizard of Ha DVD is 5060256820109. Be the first to review VeggieTales - The Wonderful Wizard of Ha DVD! Got a question? No problem! Just click here to ask us about VeggieTales - The Wonderful Wizard of Ha DVD.